We can fabricate diffraction gratings up to 20 mm2 in a variety of materials, either free standing or on SiN substrates down to 50 nm thickness for reduced absorption. For free standing gratings, the grating lines are supported by a combination of support struts which form a supporting web. 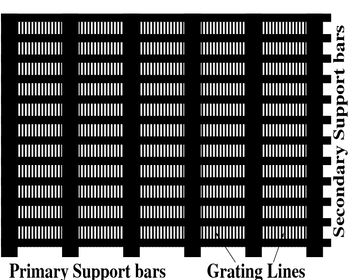 The support structure usually occupies ~ 20-40% of total, reducing the active grating area to 60-80%. The periodicity of the support lines can be chosen to give useful diffraction, complementing that of the primary grating lines! The form of this support structure is shown in the illustration below right, and can also be seen in some of the images in the gallery. The illustration to the left shows the composition of the free standing grating lines. 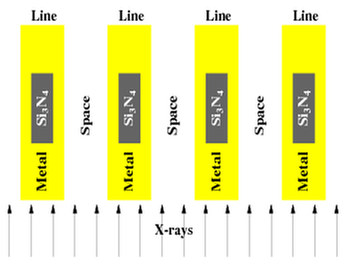 The core is usually Si4N3, and the metal shell is gold, but other metals can be used, or alternatively, no metal at all. Recently we have introduced a new range of optics in much thicker SiN, which gives reasonable Diffraction Efficiency (at soft X-rays) without the need for the additional metal shell.